UNIT287 is a refreshing and exciting power trio from Huntington Beach, Orange County, CA that creates a blend of harmonies with edgy rock riffs that have unforgettable hooks and sing-along words. UNIT287 delivers a So-Cal sound that could only have grown from the inspirational roots of Orange County... Bringing live music back to the original live music scene with new melodies and innovative arrangements that grab the attention of all audiences. UNIT287 has a long list of musical influences, but the biggest inspiration is bringing live original rock songs that have sing-along lyrics and unforgettable melodies for the fans to enjoy. 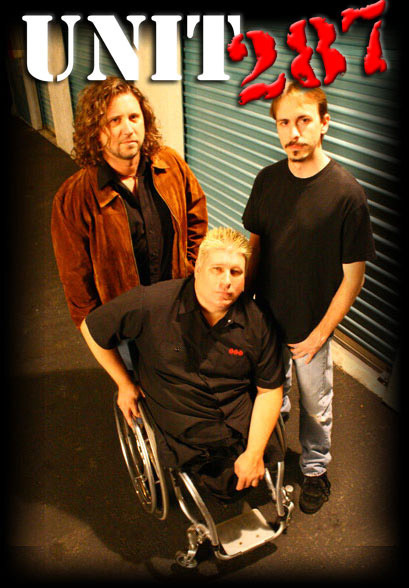 UNIT287 has played live in the Orange County music scene for several years, has been featured at NAMM and many public events. They were also honored with a nomination in the 2008 Orange County Music Awards. Joe Hardy, the drummer, is handicapped and plays a standard kit with no legs. He is not disabled in the traditional sense as his drumming abilities are endorsed by Sabian, OCDP, Roland, Danmar and many other companies. Jonas and Ryan, long time college friends, get their exceptional seasoned abilities from many years of writing, producing, and live performance experience as well as time spent in recording studios with previous bands.